At any given time random thoughts converge in our minds like background noise—garbled dreams concocted from the day’s google search hits, binge viewing, game show and sitcom reruns, celebrity trivia—all this media pulp is strained through personality so that outer reality is merged with inner landscapes. 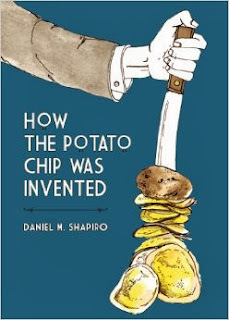 Daniel M. Shapiro’s first full-length collection of prose poems, How the Potato Chip was Invented, features the mind as it is now, media-infused, yet old-school philosophic, humanistic and comic. Hawke will say . . .
the medicine cabinet . . .
Part three reconnoiters among 70s, 80s, 90s, and early 2000s celebrities—famous and infamous—Metallica circa ’83, Lynette “Squeaky” Fromme, Natalie Wood, David Bowie, Julia Roberts, and Tom Hanks. Then Shapiro hooks us up with with Fred Astaire serenading Fergie, and Max von Sydow at IKEA. The most endearing celebrity encounter is “Don Knotts Returns to his Hometown of Morgantown, W.Va., 1982”. In the density of a masterfully written prose poem, Knotts’ professional career is concisely portrayed; then Shapiro compassionately engages us with Knott’s imaginary existential crisis as he rides a “personal rail system . . . alone until dawn.” Sometimes we, as consumers of celebrity, forget the soul behind the famous face. Purchase How the Potato Chip was Invented HERE. Reviewer bio: Kim Loomis-Bennett is a life-long resident of Washington State, besides a detour into Oregon where she met her husband. Her poems and book reviews have appeared in The November 3rd Club, The Copperfield Review, Poet’s Quarterly, and Hippocampus Magazine.Her recent work is included in The Prose-Poem Project. One of her poems is also featured on the Washington State Poet Laureate's blog at http://kathleenflenniken.com/blog/. She teaches at Centralia College. She will graduate with her MFA, January 2014.